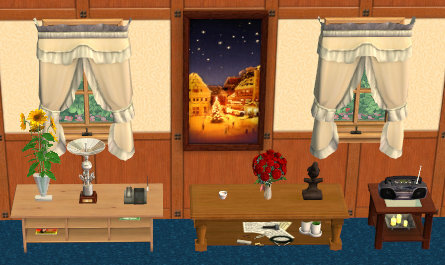 by Lord Darcy Posted 28th Jul 2008 at 6:39 PM - Updated 15th Jan 2011 at 1:07 AM by Lord Darcy : v1.05: Seasons Country Sink and Toilet were added. 2008-09-18: Updated to v1.04. 7 TVs, 4 stereos, all 6 fridges and NL bowling rack were added. zLdDarcy_MaxisMoreDecoSlot_Vanity_Teen-FT.package is now part of Overrides file. Remove it from your Overrides folder. 2008-08-28: Updated to v1.03. AL compatible version was added. 2008-08-09: Updated to v1.02. Coffee tables and 1 end table (Moroccan) were added. 2008-07-28: Added an alternative version. You can put two objects over one another in 1-tiled dressers/armoires just like 2-tiled ones. 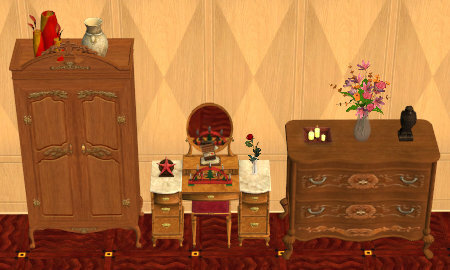 This mod adds decorative slots on top of many Maxis furniture, like dressers or vanity tables, as shown in the screenshot. Unlike "standard" surfaces like tables or counters, dressers come in all different heights. Some low dressers come close to counter heights, but not all of them. I made this mod to cut back the amount of OMSPs that I use in my game. OMSPs are great for objects with standard heights. But I don't want to carry 30+ different OMSPs that are only usable for just one dresser. Be sure to get ONLY ONE version. LdDarcy_MaxisMoreDecoSlot.zip : If you have at least one EP or SP (except for Happy Holiday Stuff). Including Deluxe (Base+NL) and Double Deluxe (Base+NL+CEL). If you have AL or M&G, get the one tagged with AL. LdDarcy_MaxisMoreDecoSlot-SlotOverlap.zip : Same as above, except that you can put two objects over one another in 1-tiled dressers/armoires just like 2-tiled ones. (See the screenshot below.) I made it as an alternative version, because this feature can be either useful or annoying depending on your preference. LdDarcy_MaxisMoreDecoSlot-BaseGame.zip : Base game, or Base Game + Happy Holiday Stuff. You must sell and re-buy objects for them to pick up the change. It does NOT conflict with any other my Stuff Pack fixes, like LdDarcy_SPObjectsFix_Downloads_AL.package, LdDarcy_TSSObjectDataFix_FT.package or LdDarcy_SP6TSSArmoireAnimFix.package. Just ignore if Hack Conflict Detection Utility reports a possible conflict. Files are grouped by object type. 2-tiled pre-OFB Large dressers don't have any decorative slots on top. New 3 decorative slots were created on top. 2-tiled Medium dressers already have 3 decorative slots enabled on top by default. But their usefulness is limited., as they can't accept lots of objects that are unprepared for decorative slots. With this mod, they can accept the same kind of objects that can be placed on end tables. 1-tiled Small dressers already have 1 decorative slot on top, but they were never used before IKEA pack. The unused slot is now salvaged. IKEA small dressers will accept the same kind of objects that can be placed on end tables. 2 Step Tansu dressers have 7 decorative slots enabled for each step. This mod also raises the support strength of all Medium and Small dressers (Maxis and custom alike). 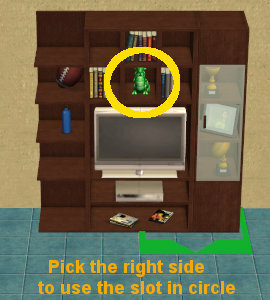 No need to turn moveobjects cheat on to put small objects on top of custom low dressers. AL finally created decorative slots on top of most Maxis dressers. The only exceptions are Teen Surfer dresser and 2 Step Tansu dressers. You still need this mod to put things on these 3 neglected dressers. Get the new AL version. Slot offsets were adjusted so that they are positioned near the center of the dresser top. You can put small objects that are unprepared for decorative slots without turning moveobjects cheat on. Armoires don't have any decorative slots by default. For pre-OFB Large armoires, 3 decorative slots were created on top. OFB-style Medium armoires also have 3 decorative slots on top, but they are placed more closely than those for Large armoires. Use center slot only, or left and right slots without center slot for the best result. 1-tiled Small armoires have 1 decorative slot on top. Slots were added only for 5 desks. Also makes the left side of AtomicAgeKids desk more useful. It will now accept objects that are unprepared for decorative slots. Each side of shelf desks was given half of newly created slots. Move the object to the other side to use all slots. 8 end tables from various EPs/SPs which have some space to put things on under the table. 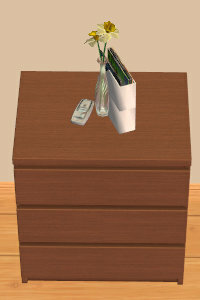 Sims won't put cups or other objects on the center slot, and the animation will be misaligned for small electronics. Use it solely for decoration. 3 one-tiled coffee tables from the various EPs/SPs which have some space to put things on under the table. 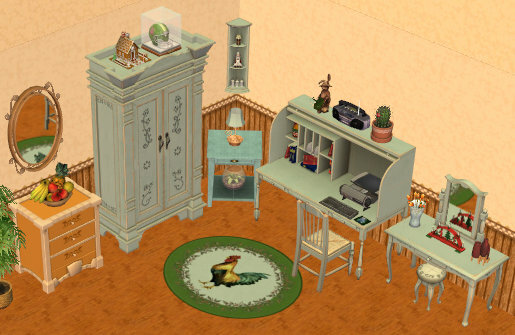 Vanity tables already have 2 decorative slots on each side, but they were never used by the game. The unused 2 slots are now salvaged. 1 slot (2 for Marble Vanity from Uni) was created in the center. For OFB Decra-Chill Food Display only. 3 decorative slots were created on top. They can be used only after you fully stock the display. 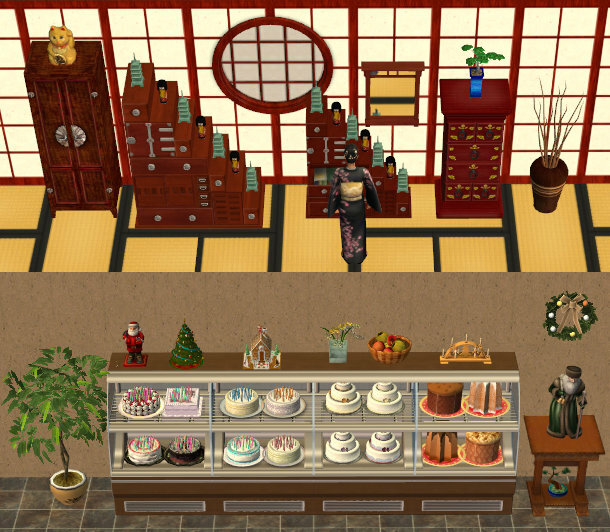 To use with custom objects that were specifically designed with Decra-Chill's height in mind (like mdhttr323's Antique Bakery Set), turn moveobjects cheat on, put the custom objects first, THEN put the Decra-Chill display. 7 TVs and 4 stereos from various EPs/SPs which have some space to put things. 1 decorative slot was created on top of all 6 Maxis fridges. 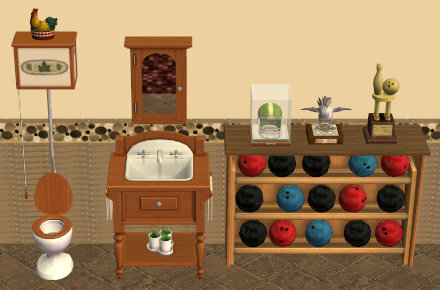 Contains NL Bowling Rack sculpture, Seasons Country Sink and Toilet. Wrong existing slot positions were painstakingly fixed. For dressers and armoires, slot ID references were removed from the front blank tiles to reduce slot overlapping, like IKEA small dressers. For multi-tile objects (except for desks), pick only one side for putting the things to avoid slot overlapping. As of AL, slot overlapping was entirely eliminated in 2-tiled dressers by default. 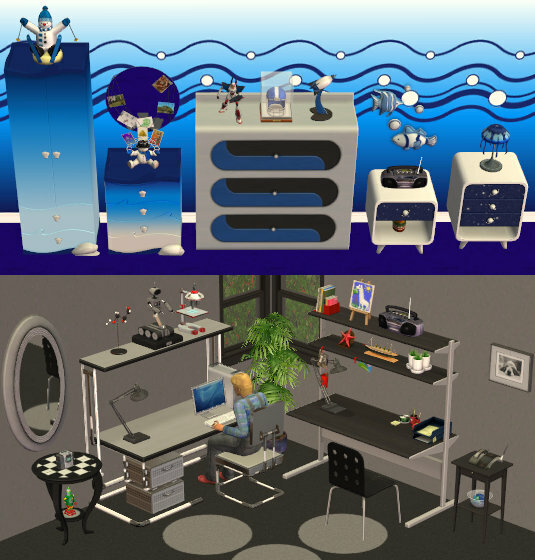 It is not recommended to put objects with which Sims can interact (e.g. phones, alarm clocks) on the decorative slots, as the animation will be at incorrect height. Use my Usable Counter OMSP for most of medium/small dressers. Sims will not travel to Seasons Country desk to put homework when they get off the school bus. It has nothing to do with this mod, this desk was designed to block homework route in the first place. For some unknown reason, TVs, stereos, fridges and sink cannot hold certain objects like OFB craftables. The center slot of AL Jock TV must be filled from right side. Otherwise Sims will not be able to watch TV, complaining that something is blocking their way. Place in your My Documents\EA Games\The Sims 2\Downloads folder. The only exception is SP Overrides file for FreeTime or later EP. If your latest EP is Apartment Life, the location will be like this. Mansion and Garden Stuff is more like a mini EP than a SP. If you have M&G, you should use M&G folder instead of FT or AL folder. Just to clarify, I didn't steal Anoeskab's work in this mod. I started to make it even before I became aware of the existence of her mod. If you closely look into the file you'll see the subtle difference.